The HYT Skull, the new proposal from the HYT Watches aka Hydromechanical Horologists, is for sure an original timepiece, not only for its design and the big skull representation but also because it does not indicate the exact minutes, just the hours, seconds and power reserve. Based on the same technology used for the H1 and the H2 models, the new watch still indicates the time by means of two liquids - transparent the first and coloured the second - that flow through a tube along a peripheral hours scale but in this case the thin glass tube was bent to frame the shape of the skull on the dial. 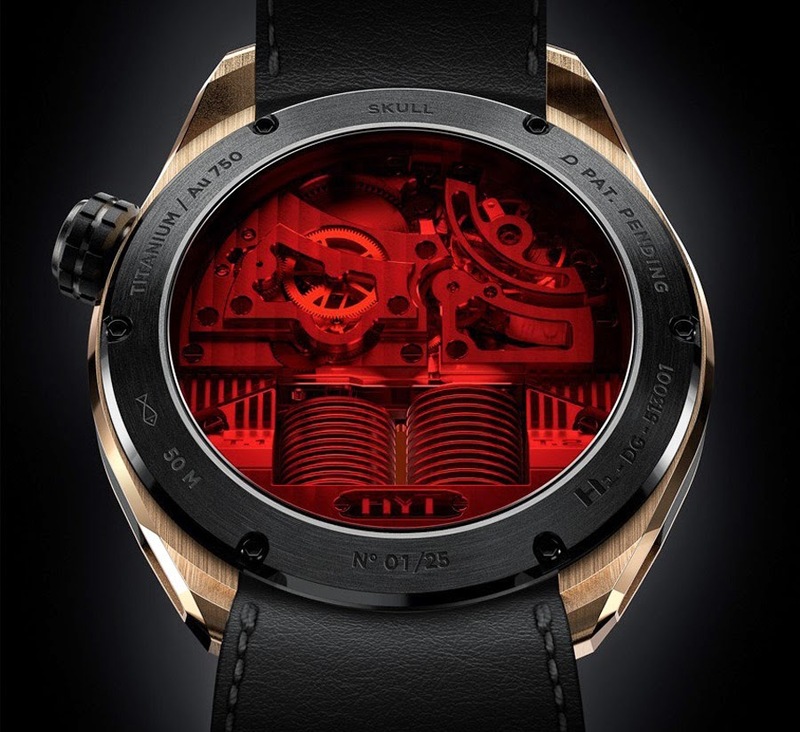 The HYT Skull will be produced in two limited edition versions: the HYT Skull Green Eye, 50 pieces in DLC titanium with green fluid, and the HYT Skull Red Eye, 25 pieces in rose gold and black DLC titanium with red fluid. 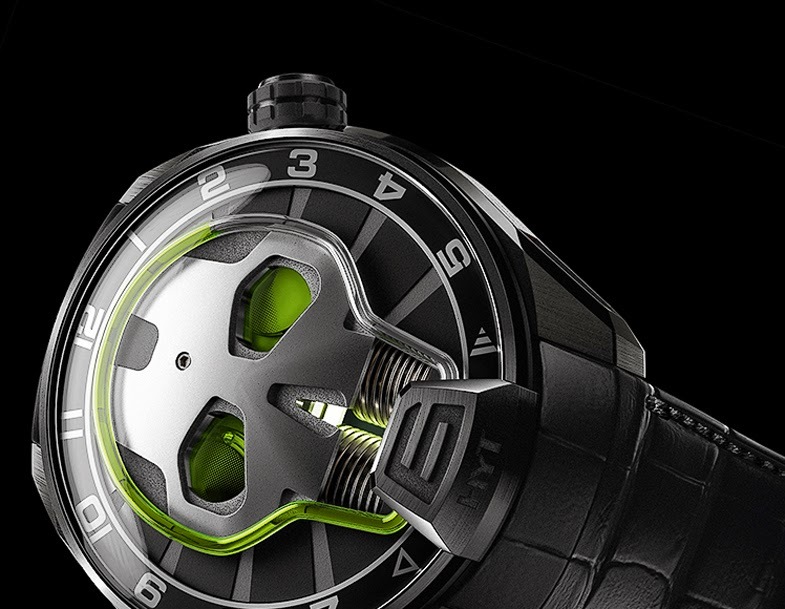 While the wearer of the HYT Skull has not a clear indication of the minutes, it is possible to have an idea based on the position of the fluid between two hour markers. 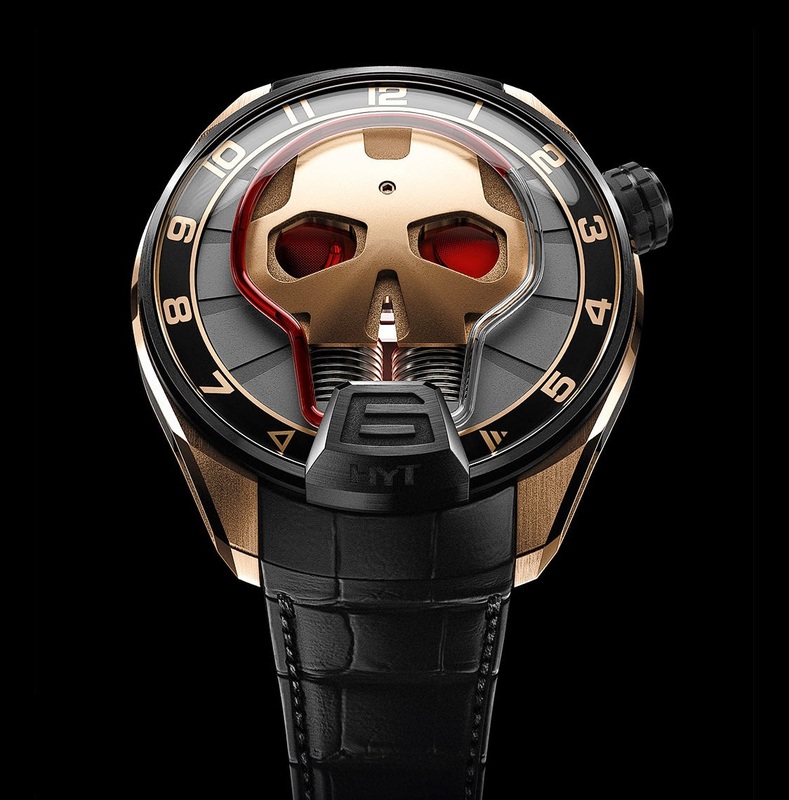 However, it is pretty evident that the HYT Skull is rather a sophisticated design object than a pure timepiece. 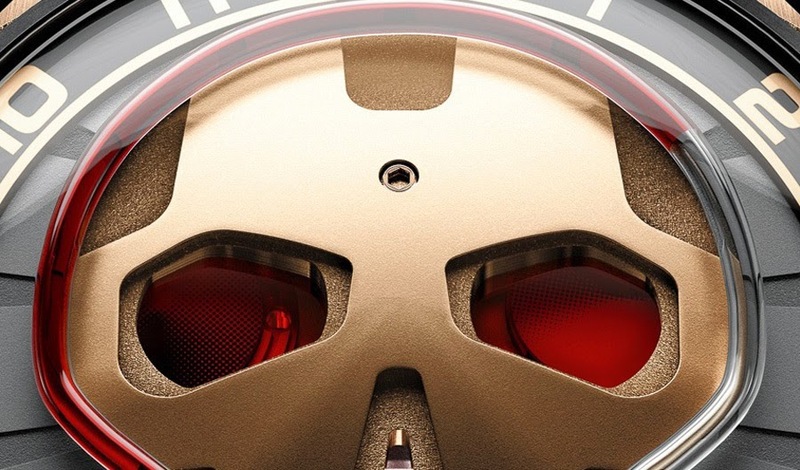 The eyes of the skull also serve as indicators with the left eye indicating the continuous seconds through a rotating dial and the right one darkening as the power reserve diminishes. For both versions, the case size is 51 mm wide and 17.9 mm thick. The rubber-coated crown is positioned at 2:30. The crown protector used in the H1 and H2 models has been removed. 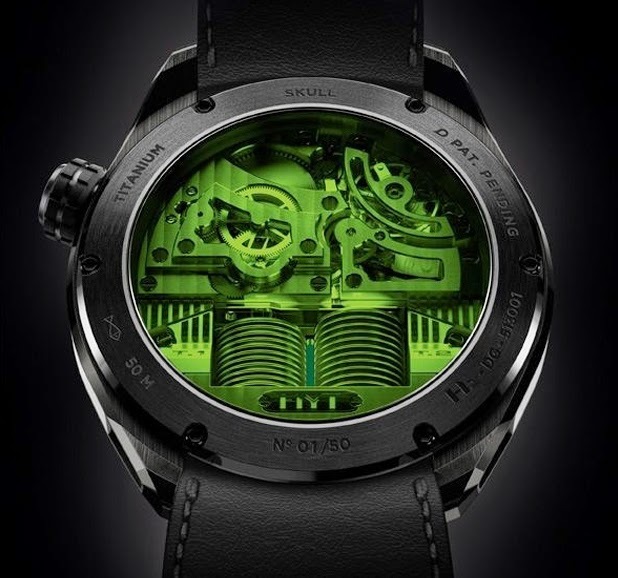 The exclusive hand wound movement is visible through the green or red tinted sapphire crystal case back and beats at 28,800 vibrations per hour with a power reserve of 65 hours. Bridges are hand-chamfered and adorned with Côtes de Genève. HYT Watches HYT Skull Green Eye and HYT Skull Red Eye. 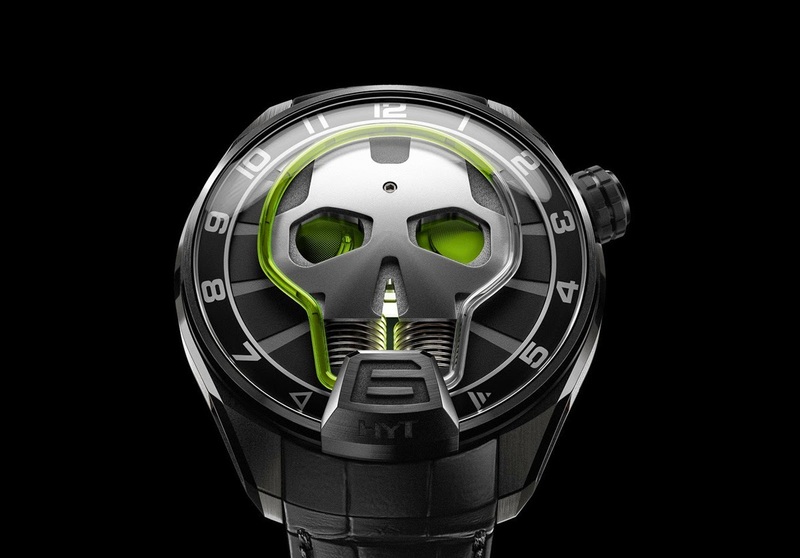 The HYT Skull, the new proposal from the HYT Watches aka Hydromechanical Horologists, is for sure an original timepiece. The HYT Skull will be produced in two limited edition versions: the HYT Skull Green Eye, 50 pieces in DLC titanium with green fluid, and the HYT Skull Red Eye, 25 pieces in rose gold and black DLC titanium with red fluid.